There isn’t much transparency around tech conferences in regards to inclusion and diversity. Startup giants have the resources and sufficient data to publish detailed diversity reports, labour-of-love events struggle to manage the time to find enough sponsorships, while commercial conferences have the resources but often times no interest in anything else other than profit. 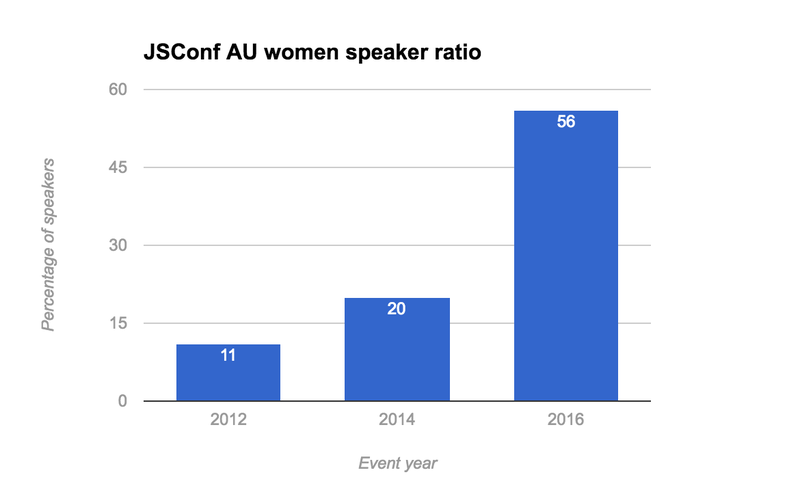 Frequently, the only way to get a marginal insight into inclusion of an event is to manually count the speaker gender ratio, look out for a Code of Conduct, ask a friend who has attended before and hope for the best. 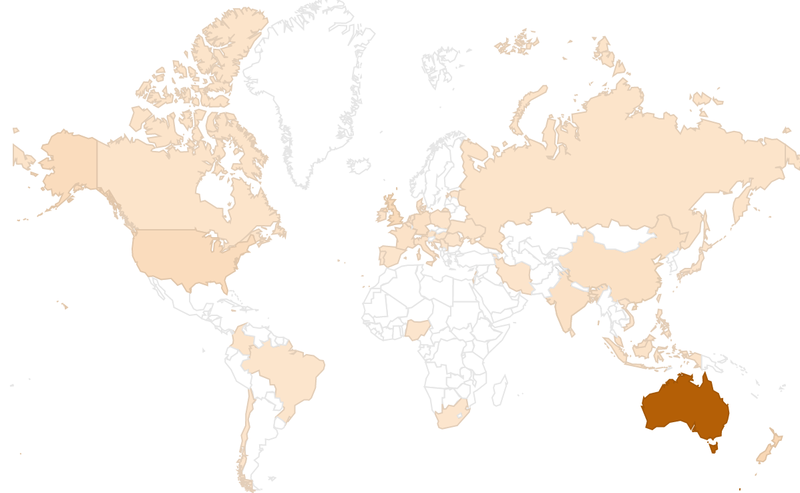 Tech events in Australia are fairly sparse, especially compared to United States and Europe. Both CSSConf and JSConf Australia have been around for three years (off and on for the latter). These events have not only reputation but standards to withhold to match their overseas counterparts. Last year, we ran the biggest festival to date, doubling the attendee headcount. The diversity bar was intentionally set really high, knowing we might fail miserably pursuing it. Despite the pride of our success and achievements we hold ourselves accountable, especially on the diversity and inclusion fronts. Today we’re publishing a transparency report offering insight into basic gender and nationality metrics, showcasing our approach to progressing the industry. 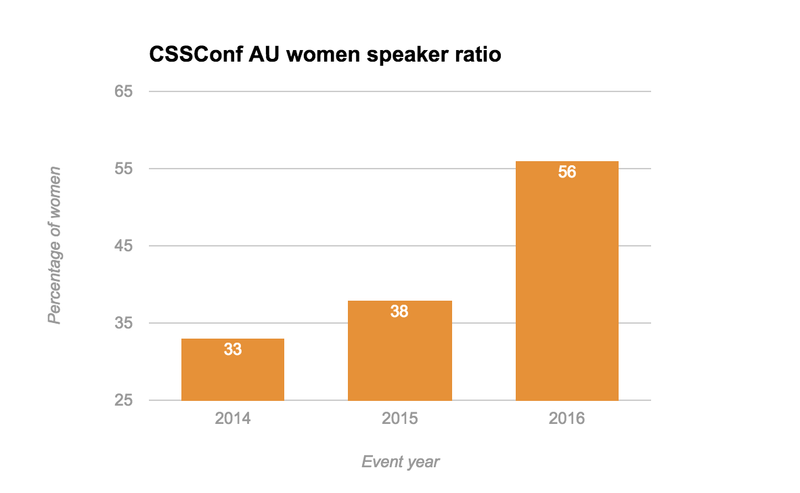 CSSConf and JSConf Australia have been around for three editions as single track conferences, hosting 8–9 speakers each day. Looking at full history of both, taking into account the fact first two editions of JSConf were handled by a different team, we’ve observed noticeable growth. The percentage of women in the lineups increased from 33% and 11% to 56%. There are a few reasons for this significant change. 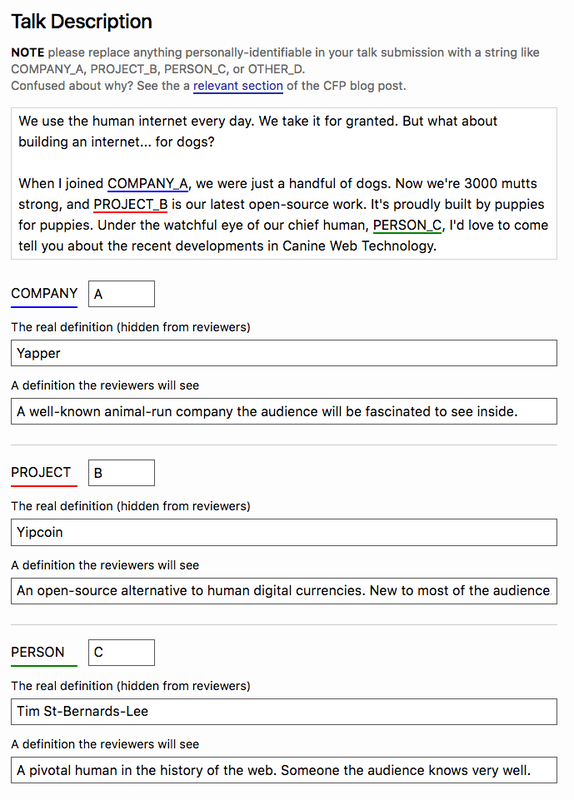 Firstly, during the first two editions of CSSConf we used a mixed approach to speaker selection; both direct invitations and an anonymous Call for Speakers process. 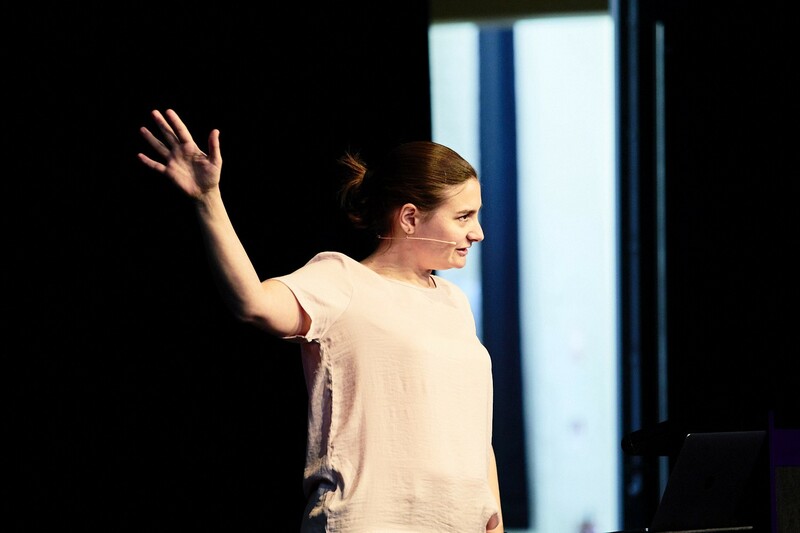 In the context of Australian tech events the aim was to provide attendees with the opportunity to see well-known speakers, which definitely provided educational value, but reflected an unfavourable gender ratio and inclusion result. That’s why last years’ event implemented 100% Call for Papers approach. We’ve put significant effort in removing bias and identifying information from submissions until we were ready to reveal the details about the talks that made it to the top 19 (out of almost 600 received). You can read in further detail about our redesigned approach in Glen Madderns’ “A Better Call for Proposals” article, but the new, experimental process yielded surprisingly positive results. We strongly believe that second reason for the incredible shift in gender representation was extensive outreach and direct invitations to apply. We’ve cast our nets widely through several Twitter accounts (such as Callback Women) and sent over 50 encouragement emails to talented women all over the world (mostly finding them through tools like the Articulate Network Directory). 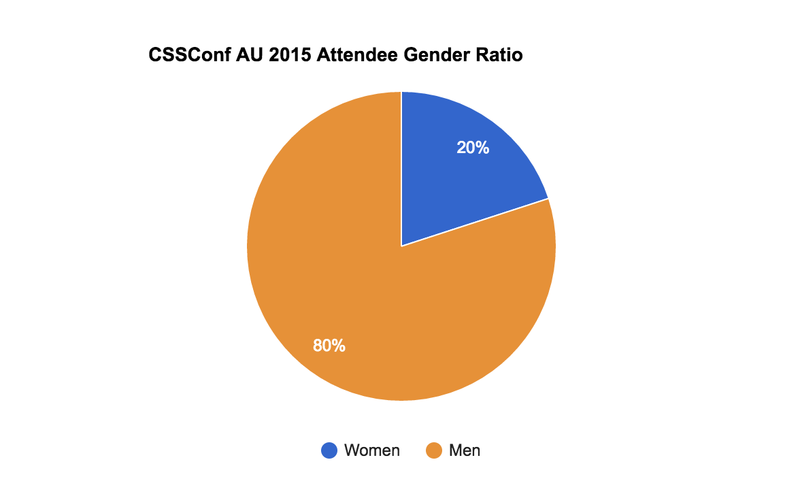 Lastly, CSSConf Australia always offered generous speaker support. This edition, apart from an all-inclusive 5-day trip to Melbourne, we were able to extend the free flight offering to partners of speakers from most of Australasia. 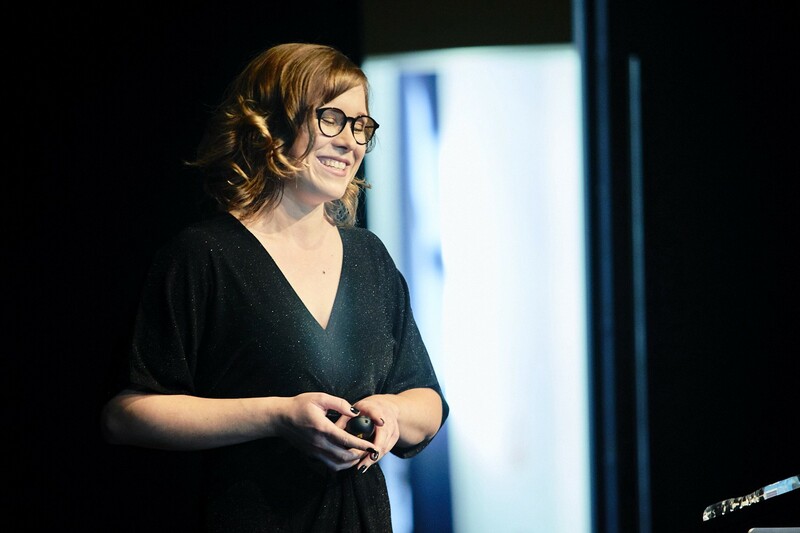 A comprehensive presenter package goes a long way, not only compensating the effort of preparing a presentation, but also ensures assistance for those who don’t necessarily have a budget allocated to travel expenditures (remember about 30% pay gap between men and women in tech). 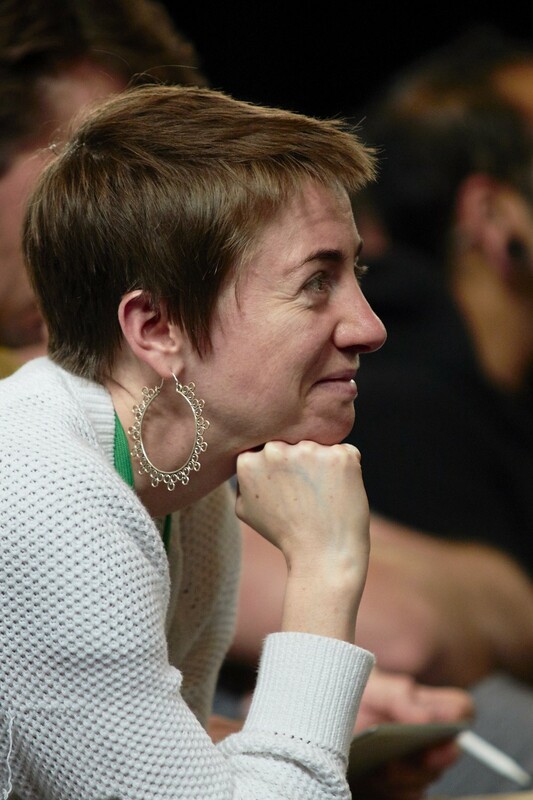 It’s hard to quantify what the industry standard for women taking part in tech events is other than the usual, which is painfully, embarrassingly low. 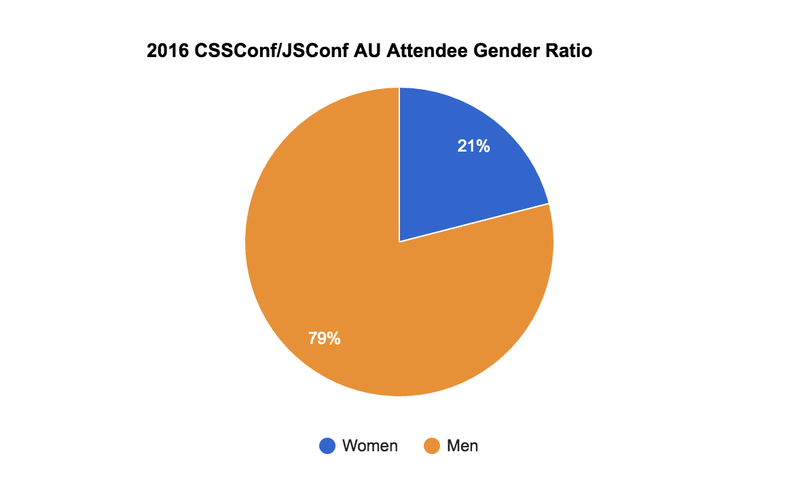 Between 2015 and 2016 we’ve observed 1% uptick in female attendees. While the number on its own isn’t something to be boasting about, the percentage carries a little bit more significance when contrasting 43 versus 122 ladies in the audience. Now, you might not understand why this is so exciting. But maybe you haven’t been to conferences where there are so few of you that each time you go to the toilet the automatic lights have gone off because no one else has been there since the last time you went. This is eerie and makes you feel so lonely. It’s indeed weird to celebrate there being a queue, but conferences are supposed to be social events to connect with your peers, and it is very demoralising to go to one and have your “singularity” amplified, instead of meeting people like you that you would not have met otherwise. The growth trend combined with possibly above average 20/80 split is heartening to see, but not satisfactory. We’d love to see an event closing on equal representation. Going beyond gender, we’ve hosted attendees of 44 different nationalities (split between international travellers and expats), covering up majority of Europe, Oceania, Asia and North America. Due to Australias’ geographical location the top two nationalities were Australian and New Zealanders, followed up with British, American and Chinese. One of the causes of increased heterogeneity was defining an inclusion strategy early on. It comprised of multiple dimensions, such as Code of Conduct and its enforcement documentation, a scholarship program for underrepresented groups, purchasable Diversity Tickets, subsidised Student Passes and an accessibility statement amongst others. Defining diversity as a top priority helped us steer the events in the right direction. It’s crucial to set quantifiable goals, but also actively unlearn and re-evaluate what we do, actively acknowledging biases and privilege. On principle, putting on a conference is a service role to the community and it has to be treated that way. Once we lose this context creating a welcoming, people-first, safe space we cannot succeed in diversification. JSConf and CSSConf Australia are striving to create a memorable, incredibly high-quality conference experience in all of their dimensions. We are always hopeful to inspire other organisers locally and globally. We won’t stop experimenting with the formula until we reach our goals. These numbers might help bring more transparency in the event space, challenge the status quo and provide a safer space for underrepresented groups. Hopefully this report will motivate you to put more effort into pursuing inclusion and diversity at your conference. Gender data was determined based on requested T-shirt cuts, hence non-binary genders are lacking in the above statistics. The report intentionally focuses on gender and nationality rather than the full spectrum of diversity. All attendee data is approximate. 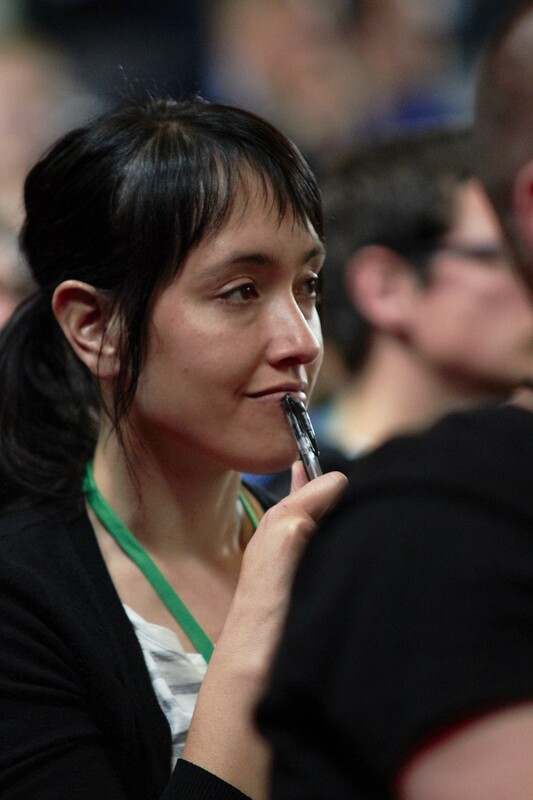 Advisor @calibreapp ✻ FE Engineer @helpscout ✻ Past curator @jsconfau, @cssconfau & @jsconfeu ✻ Here to challenge status quo.